Inflation is largely understood within the confines of a closed economy. Yet, the very idea of a closed economy is increasingly theoretical. Global trade is an important and desirable aspect of the modern world; it cannot be ignored. Aggregate supply and demand are less easily defined when much of our consumption is imported and our production exported. 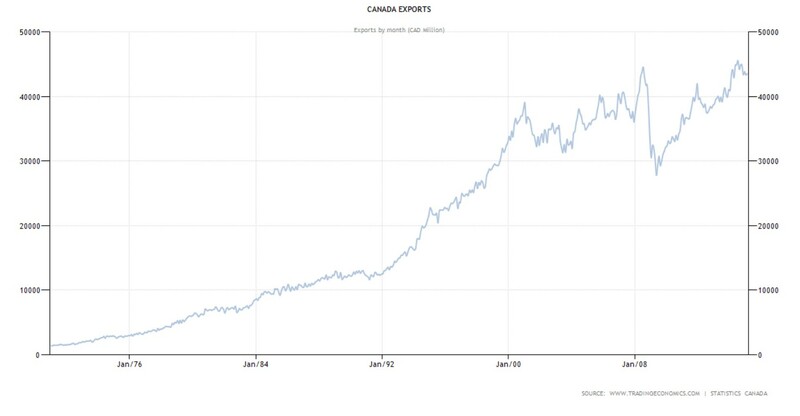 The graphs below illustrate Canadian import and export growth since 1971. Clearly, we are all becoming part of a global marketplace. The classical equation of exchange equates price level and productivity with money supply and the circulation rate of money. It tells us that total spending is equal to sales revenue. The circulation rate or velocity of money is generally constant so this equation tells us that price level is positively correlated with the supply of money and negatively correlated with productivity or output. It holds true in a closed economy because production and consumption are equal to one another, as are producer and consumer prices. Central banks examine the output gap or Philipps curve to predict inflation. These models estimate the difference between a countries potential and actual output. The Philipps curve uses employment as a proxy for output. When the economy is operating near full capacity, employment is high and marginal returns on productivity are low. People are spending money faster than goods can be supplied. The result is higher prices. However, if a central bank can perfectly match increases in the supply of money with growth in national productivity, inflation can mostly be eliminated. As an economy becomes increasingly global, these models begin to crumble. 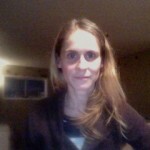 The reason is that consumers can look elsewhere to fulfill growth in demand. Likewise, producers now have access to larger and more diverse markets. Country size: Smaller countries have more isolated economies so that rates of inflation are not easily curbed by global growth. Home bias: Countries with consumers that do not have a strong preference for domestic goods and services tend to have inflation rates that are more influenced by international productivity. Ease of substitution: When consumers have easy access to foreign markets, domestic inflation will be tied to global output growth. Production tradeoff: When labor that is displaced by imports can be effectively redirected into export production, inflation will be reduced by foreign productivity growth. The basic idea behind each of these factors is that a positive shift in consumer demand that would be expected to bid up prices and ignite inflation in a closed economy, might not do so in an open economy. When consumers have access to foreign suppliers and are indifferent to consuming foreign versus domestic goods, inflation is much more difficult to predict. The new equation of exchange certainly complicates decision making for central banks. However, it better captures the forces that are currently at play. It is also worth considering that just as domestic demand can be satiated by foreign supply, domestic suppliers also have access to vast and growing global markets. As consumers, more foreign products compete for our dollar every year. 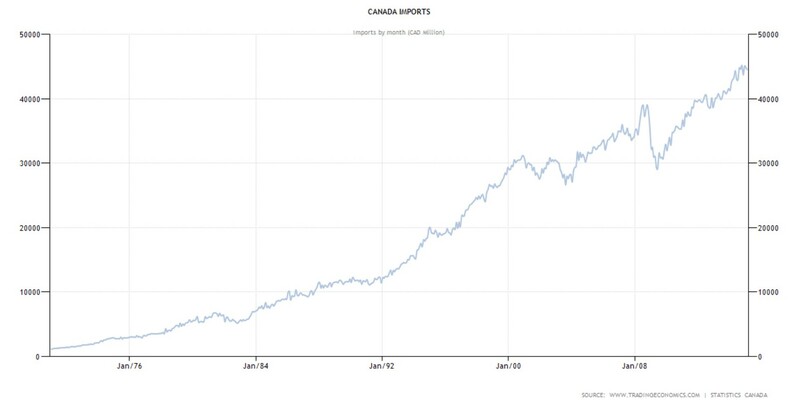 Between 1992 and 2009, imports increased significantly as a share of the Canadian market. 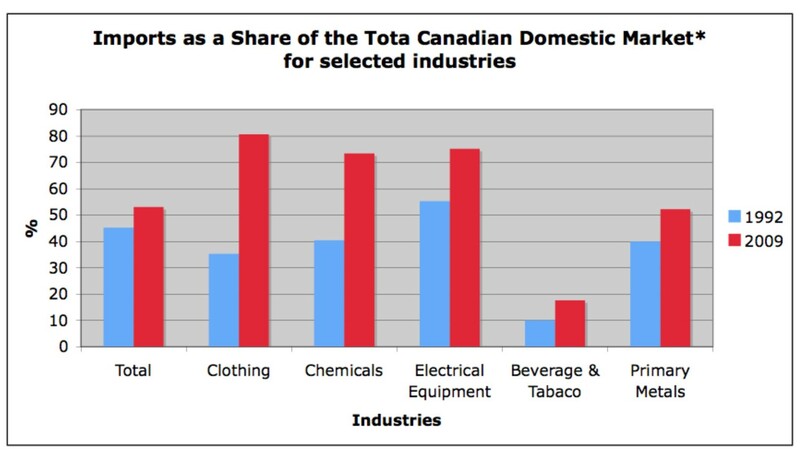 The chart below shows that by 2009 more than half of our consumption was imported. Some industries have seen more drastic globalization than others; notably, imports as a share of the clothing market jumped from 35% to 80%. The U.S., China and Mexico are Canada’s top importers, providing 60% of our imported goods and services. Almost half of our imports come from the United States alone. Incidentally, productivity growth south of the border will work to suppress prices in Canada. Essentially, inflation needs to be viewed as a global phenomenon. Many country have rates of inflation that are highly correlated with one another and can be explained by a single variable such as commodity prices. Changes in international consumption patterns shift commodity prices and that impacts price levels everywhere. Globalization unleashed a huge supply of cheap labour; this drastically increased the world’s productivity. The impact of this growth over the past 30 to 40 years has largely been disinflationary. Upperward pressure on prices has been tamed by the expansion of global markets.